What are Historical Horoscopes and Mundane Horoscopes? The study of astrology and world events, found in historical horoscopes or mundane horoscopes, can unite the disciplines of history and astrology. Applying astrology to history deepens our understanding of history. A simple knowledge based on facts becomes wisdom, when it takes into account the eonic influence of a synod like Pluto-Neptune. The fall of the ancient Roman Republic, which had lasted for centuries, occurred under the eonic influence of Pluto-Neptune. An ancient form of government had grown corrupt—and at the same time, a new form of government was born. The rule devised by Emperor Augustus would never have lasted the centuries it did had it not been born around the time of the eonic conjunction. In the same manner, a later eonic conjunction brought about the First World War, which smashed ancient Europe in ways never dreamt of. Historical horoscopes, also called mundane horoscopes, can not only record an event, but they can chart cycles. For example, after the founding of America, July 4, 1776, on its third Saturn phase cycle, also called the third Saturn Return, several major events occurred in American history: A major battle was fought in the Civil War (Missionary Ridge). This was a turning point in the American Civil War, as the South would be on the defensive for the rest of the war. Also, Lincoln delivered the Gettysburg address, one of the most important speeches about the fightr for freedom in American history. This address began, “Four score and seven years ago…”, or 87 years ago, the time it took Saturn to make its orbit around the Sun three times exactly. A mundane horoscope drawn for the date of the speech, November 19, 1863, would indicate a third Saturn return for America: The natal Declaration chart had Saturn placed at 14° Libra 48′; the cyclical mundane chart had it at 14 degrees 09 minutes. Historical horoscopes are vital to understanding history. Astrology and World Events: What Is History? History is a story constructed from the events of the past. History is the story of humanity. History can give us understanding. By studying history we can trace the rise and fall of civilizations, its causes, and the intersection of fate and human ego. The best history reads like a story. History can assist us in coming to terms with the problems and tests of our present age. We can learn from its teachings. 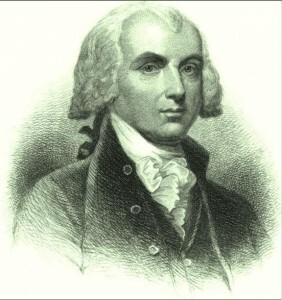 James Madison, a Founding Father and the fourth president of the United States, also called “father of the Constitution”, worked with George Washington, Thomas Jefferson, Alexander Hamilton and others to fashion a philosophy of governance and a system of laws that would endure for centuries. Their design was to form a republic of free people, who were endowed with certain unchangeable rights like life, liberty, private property, freedom of religion, and the pursuit of happiness. James Madison Chart. Click for larger view. Madison’s particular genius was to create a functional republic—vast in size and people and far larger than any in history—for a nation rather than a city state like ancient Rome or Renaissance Florence and Venice. He drew heavily upon the wisdom found in Thucydides, the ancient Greek historian, on the histories of Titus Livius, of Polybius, of Renaissance philosophers like Francis Bacon and Niccolo Machiavelli, of later thinkers like Montesquieu, Locke, Adam Smith. Without these philosophers of history the American republic would not have been possible. Astrology and World Events: Who are the most profound historians? There are a number of qualities that go into the making of great history. First, the historian must write well. Good writing whether it is Livy or Churchill is a sine qua non of great history. Second, the best history is almost always written by players, that is, those who have taken part in the management of affairs of state. If you are a journalist with no experience in running things you probably are not going to get it right: your first goal is to create a story that people will read, and you may not have all the facts, and you may not care about all the facts, and you certainly have a deadline, so most likely your story is not going to encompass the entire truth. If you are a professor who writes about history, an academic historian, but you have no experience in the real world of government, your lack of emphasis and experience will reflect that and will most likely produce poor history. The histories of Winston Churchill trump any academic history ever written; thank God he never studied history at Cambridge. Machiavelli served as a high magistrate, as part of a team who exercised power in Florence, and he served there for 15 years before going out of power. All his writings reflect a realistic understanding of power and how it is used. Ever since, Machiavelli has been read and studied. 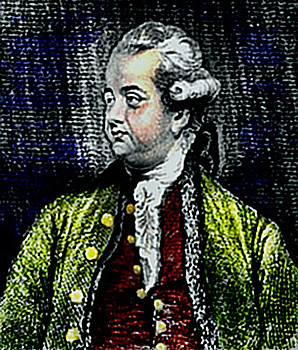 Edward Gibbon served in the military and in parliament; he understood the exercise of executive decision and politics, of what was possible and what was not; he applied his knowledge to a serious study of why the Roman Empire collapsed, and he is still read and studied today. 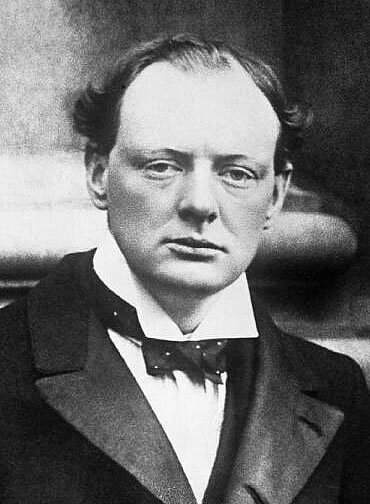 Winston Churchill was a cabinet member in both the First and Second World Wars; it is said that he was under fire in numerous wars and battles more than fifty times; he made decisions that affected vast numbers of people; as a historian, he achieved balance: there is not a line he wrote in his histories of this era that is trivial. Thucydides was an Athenian general. Livy was employed by the emperor on matters of state. Caesar was a politician and general. Frances Bacon was employed by the Queen Elizabeth I in matters of state. Henry Kissinger, an academic who became a player in the real world, fascinates the reader relating his discourses with Mao (read On China). One can go on and on with these examples. The best historians have mostly been players. Who are second best and third best? There are some second and third besters who are pretty decent historians. And there are many that aren’t. My choices for second besters—and they are given far more credit than they deserve—are Hegel and Marx and Nietzsche, the German university professors. Hegel was a professor with no experience in government: He never served anywhere or held office. He was an academic philosopher and incidentally a terrible writer; he formulated a philosophy that serves as the foundation of socialism, in all its forms. Marx was another German university professor with no experience in government, or in management of any great enterprise. His writings, also terribly written, became the foundation of communism. Nietzsche was another academic German university professor. He was the spiritual father of National Socialism. He had one quality the other two lacked: He was a good writer. That made him more readable, and more people read his works. He did serve in war briefly as a medical orderly, had a nervous breakdown and had to be evacuated. But he never managed a battle, never worked as a high official in government, never had the slightest experience anywhere in the management of affairs. These three professors exerted a vast influence on history. Yet I would evaluate their historical judgments, opinions and musings as somewhere between second and third rate. Why? They had no experience in the real world. Karl Marx. Click to view larger. How does this work in astrology and world events? Perhaps Churchill’s greatest history is his History of the Great War, a full account of the First World War, of what led up to it, the various places it was fought, and the outcome. It is also an account of the collapse of Europe as it was then in the early 20th Century. 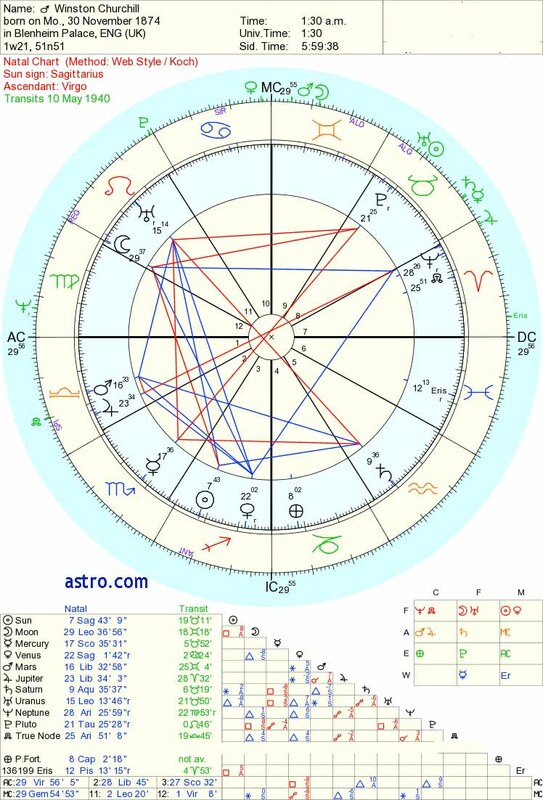 Two major aspects are important here: the Pluto/Neptune conjunction that occurred in 1890/94 has now grown into its first aspect, the 30° semi-sextile which occurred at the beginning of the war. The other aspect that Churchill described—though he did not use astrological parlance—was that Pluto, in a mundane horoscope, by transit opposing the Sun of the 1066 chart of England. It was some two degrees off at the beginning of the war; it was exact within less than a degree (and partile at times) in 1916 during the Somme Offensive (1 July – 18 November, 1916) in which a half million British lost their lives. This battle achieved very few of its stated military objectives. Trench warfare was a futile work of killing; it destroyed the reputations of many of the generals who planned it, like that of General Haig, renowned for never visiting the front lines once during the entire war . What Churchill described was a situation in which weak and confused leadership of the generals and the politicians at the top, led to disaster after disaster. Every weakness, every flaw, every evasion, every denial had a price that had to be paid immediately: Nothing could be avoided; nothing could be put aside till later. Pluto opposed the Sun tested the mettle and leadership of the people at the top. For almost a hundred years this leadership had worked well, but it had never been put under the strain of a war like this one. It was found lacking. A prime minister was removed; a new one came into office, and being more effective, held things together. It was a very close thing, whether they would win or loose this war, and whether they would loose their way of life and civilization. Pluto opposed the sun is possibly the most difficult aspect, especially one occurring at the beginning of a Pluto/Neptune eonic synod. Churchill describes every detail of this process in his history. In an earlier era, when Pluto/Neptune was destroying the Roman Republic, the philosopher and statesman Cicero was writing about the rule of law and human freedom. He knew like everyone in his era that the republic was dying, and in his writings was setting down principles that would help new republics to rise, as did the USA some 1800 years later. This is the virtue of great history. That book on the republic can be found here. Two procedures exist in getting at the structure of history—the literary or artistic, and the scientific. Earliest historical accounts are often found in epic poems or sagas. The literary or artistic procedure consists of studying this literature in order to learn about the events these poems describe. This is not as straight-forward as it may sound: Artistically fashioned accounts may contain fictional or at least unprovable elements. The scientific procedure consists of methodically gathering historical data—digging for bones and shards, measuring soil layers of ancient sites, excavating, sifting, radioactive carbon dating, etc. This form of scientific examination began relatively recently, in the mid-nineteenth century. For example, The Iliad, an epic that has been around for about three millennia, narrates the history of the war between certain ancient city-states in Greece and the city of Troy in Asia Minor. This epic poem combines history and myth. Names of people, dates, and locations are mixed with stories of gods and goddesses meddling in human affairs. Because of this interference, many modern people considered this poem a work of fiction. 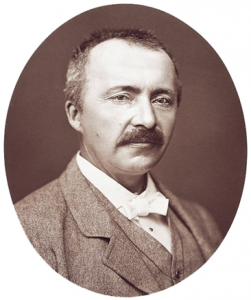 Heinrich Schliemann, a nineteenth-century German businessman and amateur archaeologist believed that The Iliad was at least partly historical. He financed an expedition to Asia Minor, and, using The Iliad as a guide, set out to look for the lost city of Troy. To the amazement of the archaeological community, Schliemann found Troy right where the poem said it was. And not only one city of Troy, but he found twenty-seven cities of Troy, one city buried beneath another.” In this example, the scientific method of historical research verified the history contained in the literary account. The Old Testament is a document of ancient literature that some might say confuses the mythological with the historical. Who can prove if God really spoke to Moses? Yet the Bible remains the register of many vanished civilizations. Modern excavations have verified that some of these forgotten cultures not only existed, but functioned exactly as the Bible described! Literary history begins in Sumer. The tale of Gilgamesh (circa 4000 to 3000 B.C. or earlier) is one of the oldest sagas in the world. It predates anything coming out of China or India, including the I Ching or the Rig Veda. In this story Gilgamesh, an immortal, is extremely upset that his brother, Enkiddu, is not immortal and has had to die. In ancient Sumer, the Gods lived right downtown in the city centers; and they were related to mortals. They were not hidden away on a distant Mount Olympus. So, while Gilgamesh is something of a historical document, in that it shows us many of the concerns of this most ancient of people, all we can say for sure is that their concerns were quite different from ours today. 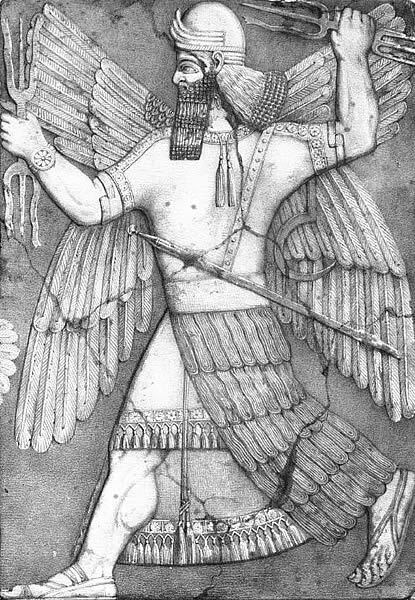 Scientific history, where written records exist, also begins with Sumer. An entire library of clay tablets in cuneiform collected from ancient Sumer was discovered in the nineteenth century excavation of Nineveh in present day Iraq. Formal history begins when the poetry and sagas were refined into a prose narrative that could be counted upon as a non-mythological record. Formal history originated in the work of Herodotus (and others) in 6th century B.C. Greece. 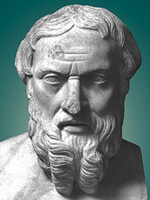 A story-teller of high genius, Herodotus was able to establish narrative history as a new art form. Formal history in Western civilization is based on empirically provable sources. One need not study the text in order to extract the fictional, outlandish elements from what actually happened. Everything is supposed to reflect true information, unembellished facts, without interpretation or insight. I call this kind of account “journalistic” narrative. In my opinion, some of these straightforward journalistic histories are quite valuable. What I call “great history” goes beyond journalistic narration in an attempt to get at the meaning that lies behind the events. Why did this particular sequence of events happen? Was it inevitable, given a certain set of circumstances or actions? Or was it merely fortuitous? The historian tries to give the reader an understanding of the processes involved in history. Great history has a theme, a philosophy of history. Herodotus and another Greek historian who followed him, Thucydides, were two of the first historians; they remain two of the greatest today. The Histories of Herodotus describe the life-and-death struggle that occurred between the Greeks and the Persians. 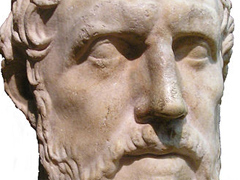 With great insight Herodotus shows how the Greeks in the 6th century B.C. were developing elements in the individual human mind, aspects of creation, originality and invention, taking the human race beyond its previously known limits. The Persian emperor, Xerxes 1 (519-465 B.C.) had amassed one of the most powerful armies in history, over a million strong. He proposed to go to war against Greece making it a Persian province. After all, it was wealthy and prosperous, and it looked ripe for the conquering. Herodotus demonstrates that if Xerxes had been successful in his journey of conquest, he would have destroyed the newly flowering spirit of the Greek renaissance which is the base of our civilization. If the emperor had succeeded, we would not be what we are today—for without the breakthroughs of ancient Greek science and math and political philosophy we could be today without science, without institutions of freedom and the rule of law, without computers and space travel and subatomic physics and electric power and thousands of other ideas and applications. The Persian emperor would have exterminated this awesome creative force that was developing in Greece, which later spread out (with some help from Alexander the Great and the Roman Empire) to transform the human race. The Emperor Xerxes might have cherished some of the most exalted representatives of that spirit. Perhaps he would have taken them to Susa (the capital of the Persian Empire) as valued clerks and instructors for the aristocratic youth. But the spirit of the age would have died. Herodotus’ genius lay in recognizing the importance of that war to the survival and flowering of Greece. The Greeks won. They triumphed over Persia. Their success, however, destroyed their governments but not their learning and culture. Like their enemies they became immersed in unjust wars of self-aggrandizement and empire building. 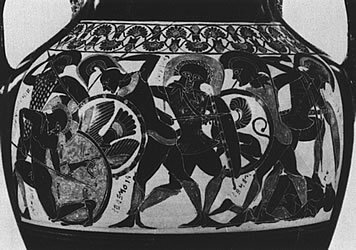 These were called the Peloponnesian Wars (431-404 B.C.). History teaches that success can lead to new tests that can destroy a civilization, collapse an empire. Many of the finest minds of Greece disagreed with the aims of these wars. The keen analytic mind of Thucydides dissected this war; his History of the Peloponnesian Wars is an account of a society that is so triumphant and victorious that it has become too egocentric. With a sere irony, he lays bare the souls of the major actors of that drama. The theme of this great history is the misuse of power. All through his writing we can trace the thread of an ominous prophecy of the fall of the Greek city-states. It is also a story of growth into something larger. While the Greeks ran city states very well, they never learned how to run a nation. The histories of Thucydides and Herodotus also chronicle the growth and unfolding of the power of the individual. Their histories chronicle the birth of something new in human civilization. Societies began to provide conditions that foster creativity in large numbers of people. This new way of organization goes against the older paradigm of one powerful individual in each society, who exercises the authority of life and death and creativity over all the others. The previous top-down structure tended to limit the unfolding of human potential in anyone except the one at the top. During early history, the cultivation of the individual mind was limited to the emperor, the king, and perhaps a few trusted advisers around him. Numerous examples exist of pharaohs in Egypte and Incas in South America who cultivated their minds to levels of genius and achievement unmatched by anyone else in their time. Individual human beings served as scribe, peasant, slave, soldier, priest, aristocrat, bureaucrat—a role, a functioning unit in a larger collective—as they were in Egypt or in the Olmec or Inca civilization in Central and South America. King David (circa 1000 B.C.) is an example of a genius who cultivated many sides of his nature while functioning as the head of state in ancient Israel. He was the greatest general of his age, but to this day has still greater renown as author of the Psalms. Frederick the Second, (26 December 1194 – 13 December 1250), the Holy Roman Emperor, crowned at Aix-la-Chapelle in 1215 A.D., was the most outstanding mind of his age. He developed all sides of his personality; he excelled as artist, warrior, writer, parent, scientific investigator. Ivan the Great, also known as The Terrible, was the greatest mind of Russia in his era. He founded the modern Russian state. Peter the Great followed a century later. He was also the greatest mind in his era, and he brought Russia into the modern world. Frederick the Great of Prussia was the most brilliant mind in Prussia; his flute concerti are, I feel, some of the most beautiful ever written. He was a great general. He wrote many books. These men at the top lived and worked in no community of great minds from which they could draw sustenance. The system allowed only them to flourish. No one else around reached their height of vision and achievement. Voltaire always complained that the court of Frederick of Prussia was boring—because he could talk to no one except Frederick. Yet in ancient Greece and in other cities around the Mediterranean, a flowering of the individual was taking place in every area of human endeavor. It was not just confined to the ruler of great genius. Saved from extinction during the Persian Wars, this blossoming of the spirit was taken up by the Romans and spread into Asia Minor, then Asia, and Europe. It still exerts its influence on the human mind. Another great historian, this one from the Roman era, who also extolled the power and worth of the individual, was Plutarch (45?-120 A.D.?). In his history, which we call Plutarch’s Lives, he discussed the historical process through the medium of biography, of some of the greatest personalities of Greece and Rome. He showed how great individuals developed many different sides of themselves to a very high degree. 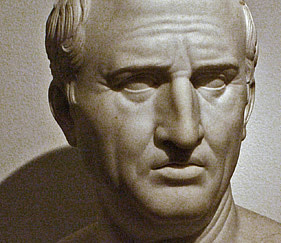 According to Plutarch, Julius Caesar, the general and senator, was also a poet of the highest caliber. Caesar’s fascination with science and astronomy and time led to what today is called the Julian calendar. This theme of the development of each individual’s gifts and talents runs through all Plutarch’s historical biographies. In a society where there are certain guarantees that individual freedom will not be squelched by arbitrary authority, enormous mental and spiritual achievement becomes possible for large numbers of people. Aristotle called it the pursuit of happiness. Records like those of Plutarch were forgotten but never lost, even when civilization under the benign totalitarian rule of the Roman Imperium began to sink into darkness. Plutarch’s ideas returned during the Renaissance; then his models re-inspired. Once again great individual human minds re-emerged: Leonardo da Vinci founded modern science and achieved high visionary levels in his art; Galileo revolutionized astrology and astronomy. Without models from antiquity remembered in history by Plutarch and others, this evolution might never have happened, or might have gone much more slowly. During the period of the American Revolution, which in effect began in 1763 and lasted to 1783, another historian was analyzing some of those hard lessons of antiquity. In 1776, Edward Gibbon published The Decline and Fall of the Roman Empire, one of the greatest works of history in the English language. This narrative describes in several thousand pages of meticulous detail the slow unraveling and collapse of a civilization. During the Roman Empire, the executive, the judiciary, and the military caste—the elements that ruled—had total dominion over an individual citizen’s pursuit of creative self-expression. Any such expression was discouraged by these authorities. This resulted in a centuries-long decline in expression of the human spirit described, emperor by emperor, in perfect detail, in story after story. Gibbon’s Decline and Fall is great history. It will be around for millennia because it shows the root philosophical causes of the degeneration of empire. This great work is a warning to us today that any civilization can fall into a dark age; it also advises us just how difficult it is to stop from happening; it offers a history of the Emperor Constantine the Great to demonstrate remedies for these problems. Personal memoirs can produce great history. 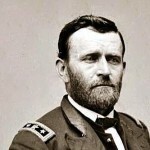 U.S. Grant’s Memoirs is an exceptional personal history of the American Civil War. He wrote them on his deathbed in a remarkable first draft. U.S. Grant. Click to view larger. … We landed in front of a cornfield. When the debarkation [from steamships] commenced, I took a regiment down the river to post it as a guard against surprise. At that time I had no staff officer who could be trusted with that duty. In the woods, at a short distance below the clearing, I found a depression, dry at the time, but which at high water became a slough or bayou. I placed the men in the hollow, gave them their instructions and ordered them to remain there until they were properly relieved. These troops, with the gunboats, were to protect our transports. By this time the enemy discovered that we were moving upon Belmont and sent out troops to meet us. Soon after we had started in line, his skirmishers were encountered and fighting commenced. This continued, growing fiercer and fiercer, for about four hours, the enemy being forced back gradually until he was driven into his camp. Early in this engagement my horse was shot under me, but I got another from one of my staff and kept well up with the advance until the river was reached. …I knew the enemy had crossed over from Columbus in consider­able numbers and might be expected to attack us as we were embarking. This guard [that Grant had first emplaced] would be encountered first and, as they were in a natural entrenchment, would be able to hold the enemy for a considerable time. My surprise was great to fmd there was not a single man in the trench. Riding back to the boat I found the officer who had commanded the guard and learned that he had withdrawn his force when the main body fell back … Then fearing that the enemy we had seen crossing the river below might be coming upon us unawares, I rode out in the field to our front, still entirely alone, to observe whether the enemy was passing. The field was grown up with corn so tall and thick as to cut off the view of even a person on horseback, except directly along the rows…. I had not gone more than a few hundred yards when I saw a body of troops marching past me not fifty yards away. I looked at them for a moment and then turned my horse towards the river and started back, first in a walk, and when I thought myself concealed from the view of the enemy, as fast as my horse could carry me. …Before I hot back the enemy had entered this forest and had opened a brisk fire upon the boats. Our men … were now either aboard the transports or very near them. Those who were not aboard soon got there and the boats pushed off. I was the only man of the National army between the rebels and our transports. The captain of a boat that had just pushed out but had not started, recognized me and ordered the engineer not to start the engine; he then had a plank run out for me. My horse seemed to take in the situation. There was no path down the bank and everyone acquainted with the Mississippi River knows that its banks, in a natural state, do not vary at any great angle from the perpendicu­lar. My horse put his fore feet over the bank without hesitation or urging, and with his hind feet well under him, slid down the bank and trotted aboard the boat, twelve or fifteen feet away, over a single gang plank. I dismounted at once and went to the upper deck. …When I first went on deck I entered the captain’s room adjoining the pilot-house, and threw myself on a sofa. I did not keep that position a moment, but rose to go out in the deck to observe what was going on. I had scarcely left when a musket ball entered the room, struck the head of the sofa, passed through it and lodged in the foot. So this is fabulous history, written by a player, who learned he had a gift for writing in his last days and used it, and who concentrated only on essentials. The Memoirs will be read a thousand years from now. Sometimes a history does not have to consist of a sweeping panorama of events to impart a deep philosophical understanding. Profiles in Courage, by John F. Kennedy, focuses narrowly on one particular quality needed by a statesman: his willingness to take an emphatic stand against popular opinion in order to maintain the integrity of the state, or as Aristotle would have it, promote the public good. This small book is a valuable contribution to the understanding of political courage in the historical process. Even a fictional novel can be considered great history if it furthers our understanding of the process that lies behind events. Such is the case with Tolstoy’s War and Peace and with Solzhenitsyn’s August, 1914. Both novels delineate the procedures of councils of state and how the Czar made his decisions (but in different eras). Like Grant’s Memoirs, they show exactly what occurs on the battlefield, with all its confusion and terror and madness and courage. Tolstoy’s descriptions of Napoleon are the best I have read anywhere, including those of the French historian Bourienne (but perhaps excluding Paul Johnson’s brief biography). Tolstoy describes a man who is the darling of fate, who could seem to do no wrong, yet who at the Battle of Borodino (1812) and later in the evacuation of Moscow was destroyed. There are two sides to the life of every man: the personal life, which is free to the degree that its interests are abstract, and the elemental life of the swarm, in which he ineluctably follows the laws decreed for him. Consciously man lives for himself, but unconsciously he serves as an instrument for the accomplishment of the historical, social ends of mankind. An act committed is irrevocable, and that action coinciding in time with the actions of millions of other men acquires historical significance. The higher a man stands in the social scale, the more connections he has with people and the more power he has over them, the more manifest is the predetermination and inevitability of his every act. “The hearts of kings are in the hand of God.” A king is the slave of history. History, that is the unconscious, common, swarm life of mankind uses every moment of the life of kings as an instrument for its own ends. Though Napoleon at that time, in 1812, was more convinced than ever that it depended on him to shed or not to shed the blood of his people … he had never been so subject to inevitable laws, which compelled him (while thinking that he was acting of his own voli­tion) to do for the world in general, for history, what had to be done. The historical novel, War and Peace, describes mass movements and the sources of power of true leaders. Most of the generals described in this novel are incompetents, completely out of touch with what is happening on the front lines. But Tolstoy draws the portrait of one general, Count Bezuhov, who is an effective general because he stays in the present flow of time, in the Tao, in touch with what is happening now. It was only after Tolstoy’s novel was published that General Bezuhov received the recognition his victories deserved. Lincoln’s Chart. Click for larger. Carl Sandburg’s Abe Lincoln is the history of an era in the guise of a biography. It describes how a free people came to terms with the greatest crisis in their history. In story after story, it portrays events that led up to the American Civil War. Sandburg uses the colloquialisms and syntax and slang peculiar to 19th century America to impart the flavor and feeling of that era. Throughout, Sandburg depicts Abraham Lincoln—his fate, his sadness, his karma and burdens, his deep spirituality, his laughter and his joy, and his triumphs. At the end of it all, you feel that here was a man, one of the greatest to ever walk across the stage of history. His story of Abraham Lincoln describes a man guiding a ship that is running before the approaching hurricane—a maelstrom of conflict of peoples over slavery and oligarchy and the coming destruction of the American republic. It describes how he brought this vessel into safe harbor, even though the hurricane followed him in and crushed him personally. For more on Lincoln, visit the Saturn Neptune page.